but I would like someone to tell me what we are fighting for. Some stories don’t need a serial epic. You want what you want for wanting’s sake. Mother, apart from everything, I have gone looking for you, as you must have known and as you must continue to know. The color of searching and also of the darkness is blue, the blue leaves and their bluer underbellies. The blue boat of the coming dawn. Night remains itself, cooler in some places than in others; its generative nature remains also, despite the already-gone quality of starlight. I have wanted to explain certain things about the difference between the brain and the body. Not that I’m some sort of Cartesian dualist but we also choose neither the shell nor the way in which it is received in the world. Sometimes we think we can hide the body in work. Sometimes the body becomes honored in work, as in “Filipinos are really hard workers.” Oftentimes that honor lies in wait like a cartoon trap covered in leaves. The leaves are blue, or they are ordinary green and brown. And then the mind works too hard when the body does not have to. When the body, for instance, has been constructed as neutral. When I desired to become more specifically utterable and less like the sound of tides, a mild whoosh, you were alarmed. You disguise your alarm as nonchalance, which exacerbates my generalized anxiety. You say “you’re like barely Filipino, I don’t even feel Filipino” and I want to say “Filipina, mom” but instead both my spellcheck and the strap around my chest draw a bright red line under my torso. In the end you have nothing for which to answer, as I have been bad at asking. I remain terrified of the ocean and laugh it off by making jokes about the food chain. Something could just straight up eat you, I say, bobbing along. You could just be subsumed and no one would know you were ever there. Kimberly Quiogue Andrews is a poet and literary critic. She is also the author of BETWEEN, winner of the 2017 New Women’s Voices Chapbook Prize from Finishing Line Press. 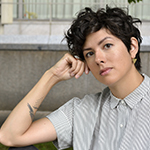 Her recent work in various genres appears in Poetry Northwest, The Shallow Ends, The Recluse, the Los Angeles Review of Books, ASAP/J, and elsewhere. She lives in Maryland and teaches at Washington College, and you can find her on Twitter at @kqandrews.